Today I found something curious in a composite upgraded from 11g to 12c, regarding DVMs. I sometimes use DVMs in BPEL to prevent the use of complex xpath expressions with many conditions. For instance, if I need to know if a JMSType is in a certain range and if it is I need to continue, I can create a DVM that has those JVMTypes correlated to an indicator. Here you see that the reference to the transformation is relative to the BPEL process, and thus '../Transformations'. <bpelFault><faultType>0</faultType><subLanguageExecutionFault xmlns="http://schemas.oracle.com/bpel/extension"><part name="summary"><summary>XPath expression failed to execute. The XPath expression failed to execute; the reason was: oracle.fabric.common.xml.xpath.XPathFunctionException: Unable to get Metadata Manager for DVM "oramds:/deployed-composites/default/DVMs/DWN_Types.dvm"
Please ensure the Metadata Manager is available. 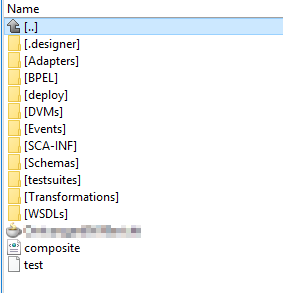 After some investigation and trial&error, I found it very peciuliar, that the reference apparently evoluated to: oramds:/deployed-composites/default/DVMs/DWN_Types.dvm. This actualy means that it searches for the DVM in the MDS relative to the deployed composite, but outside it's own folder. After the ../default/.. folder reference it should have the composites name and version/id. I tried it without the '../' reference in the path, and that worked! In SOA 12c the ora:doXSLTransformForDoc() function is apparently executed in the context of the BPEL process and thus relative references to the XSL file should be done relative to the BPEL process. In SOA 12c the dvm:lookupValue() function appears to be executed in the context of the composite, so the reference to the DVM file should relative to the composite (composite.xml). Now, you might state that DVM's should be in the MDS and then it should not give any problems. But in this case, the DVMs are strictly, particularly meant to drive the execution of the BPEL process. And thus should be part of the Composite. You could see them as an simple alternative for a business rule, or a more configurable condition-evaluation. DVMs in this category should not be shared through the MDS.